When my husband turned a vegetarian (after his by-pass surgery) it was very difficult to turn his all time favourite non-vegetarian dishes into vegetarian dishes (mutton rogan josh,lamb biryani,shammi kebabs….) but i was really concerned for his health, i had two very small girls and i myself was extremely young , it was traumatising. I started reading a lot of cooking books and this was the first time ever that i was getting involved in the kitchen but slowly and slowly i started enjoying it. My cooks still get upset with me when i try to tell them to do something in a particular way ( they still treat me like a kid and think i would just create mess ) but trust me i have learnt and am still learning and this is how and why i learnt to make a vegetable biryani. This is a really delicious rice dish. A perfect combination of drama and elegance. This dish requires a little effort ( trust me its worth it ). 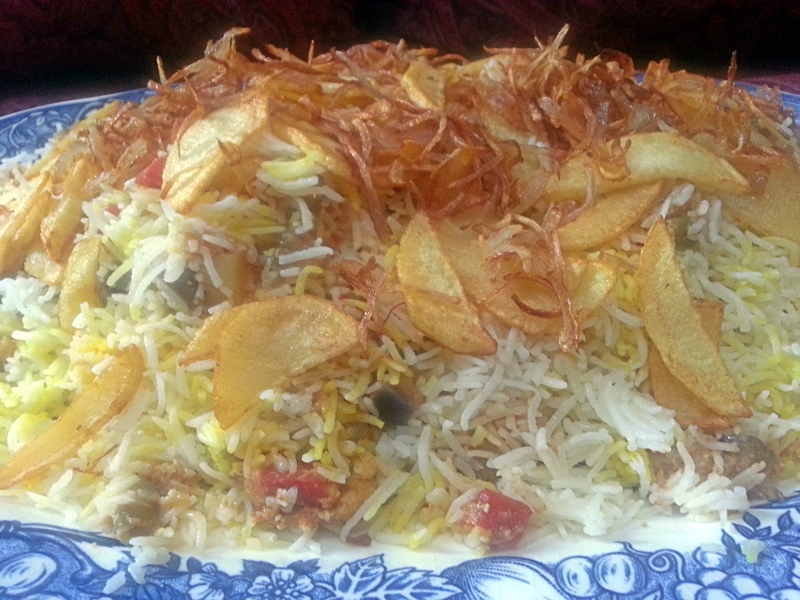 Long grains of perfectly cooked basmati rice hiding a layer of vegetables cooked in rich sauce topped with a layer of beautiful golden fried potatoes and crispy onions. The cream and the yoghurt add so much more flavour to the dish . It is for special occasions when you want to enjoy a good meal with your family and friends. A little yoghurt ( stir some chopped coriander leaves ,shredded mint leaves a small clove of grated garlic and seasoning in your yoghurt) on the side and its perfect. 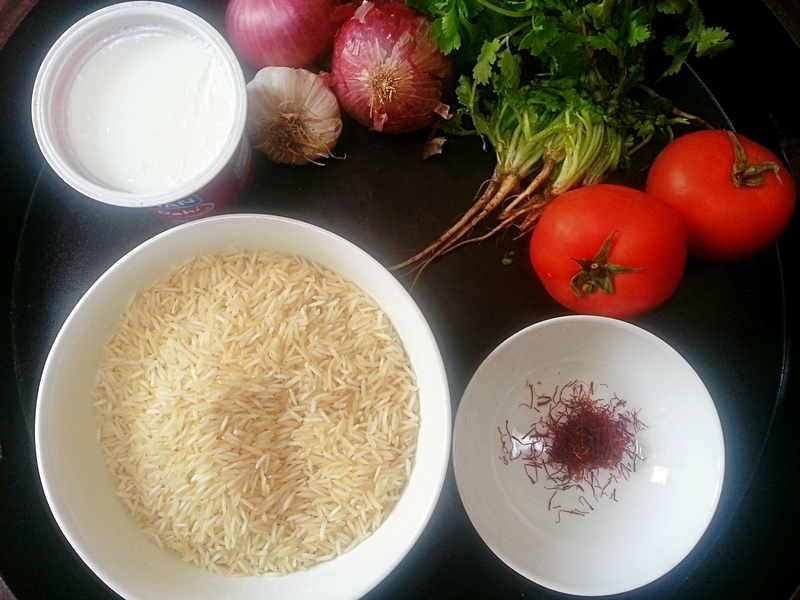 Bring the drained rice and whole spices to the boil in salted water to cover by 3.5-4 cm. Simmer for four to six minutes, until just done.Drain the water, return the rice to the heat, allow excess moisture to evaporate for ten seconds , then set aside. 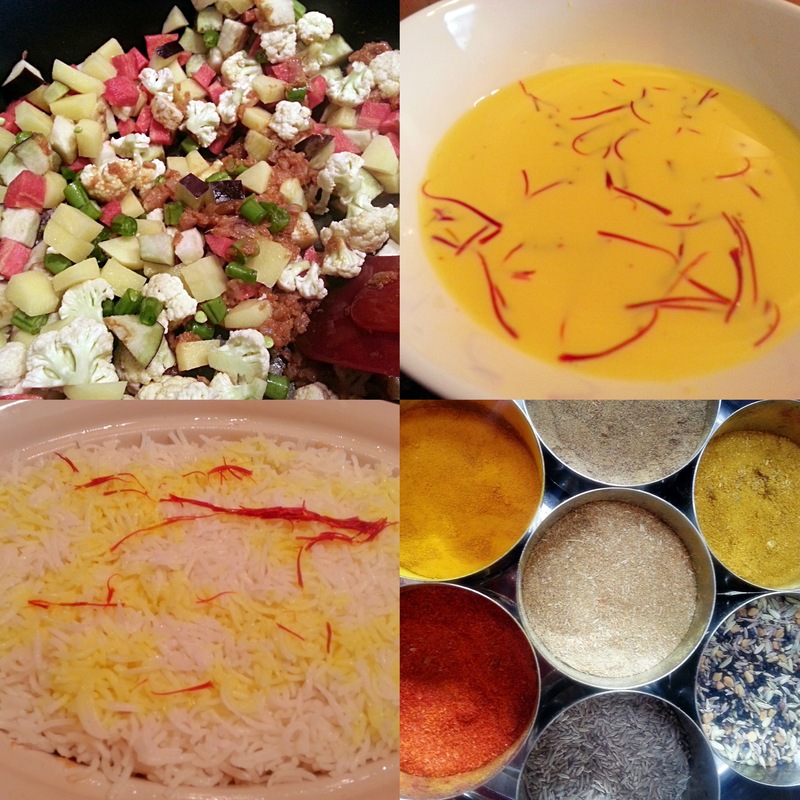 Heat the milk and saffron for assembling the dish together , set aside. For making the vegetables , heat the oil in a large non-stick saucepan . Add the chopped onion and cook until lightly golden add the grated ginger and garlic and cook, stirring ,over a low flame for a minute or until you can smell that the garlic is cooked. Meanwhile Blend the tomatoes until smooth . Add the spices and tomatoes to the cooked onion and keep stirring occasionally , for eight to ten minutes, or until the paste releases some oil back into the pan. Add the carrot, cover and cook for five minutes. Stir in the cauliflower, peas, mushrooms, aubergines, potatoes salt and yoghurt. Bring to the boil, stirring often, then cover and simmer until the vegetables are cooked through, around 10 minutes. Add the cream, cook for 5-7 more minutes taste and adjust the seasoning . Choose a large flameproof and ovenproof dish that has a tight-fitting lid. 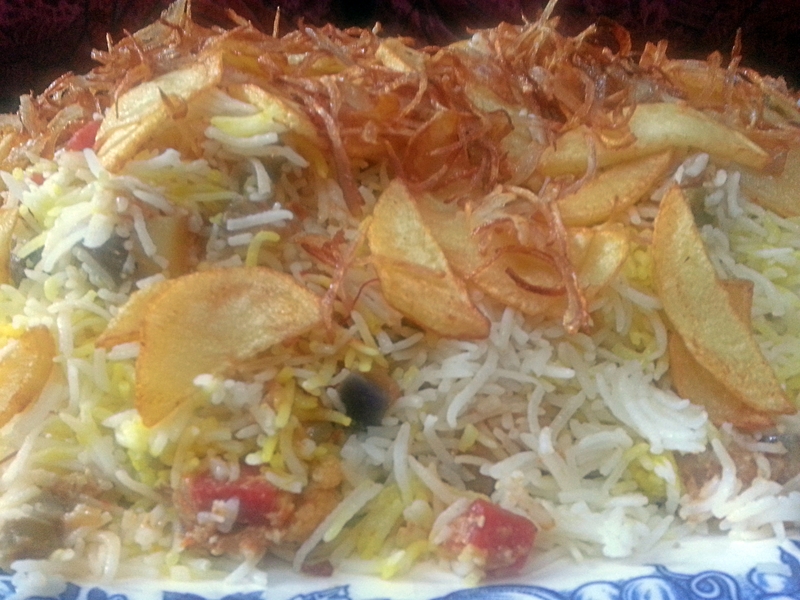 Spread in half the rice, and drizzle over some saffron milk. Spoon over the vegetables, then the remaining rice. Drizzle over the remaining saffron milk then evenly dot cubes of butter on top . Cover. About 30 minutes before dinner , place the dish in preheated (160 degree centigrade) oven cook for half an hour , or until heated through. In the mean time deep-fry the sliced onion until deep golden brown. Remove with a slotted spoon and drain on kitchen paper. Add the potatoes to the oil and fry until golden and cooked; place on kitchen paper and sprinkle with salt. Keep these warm. 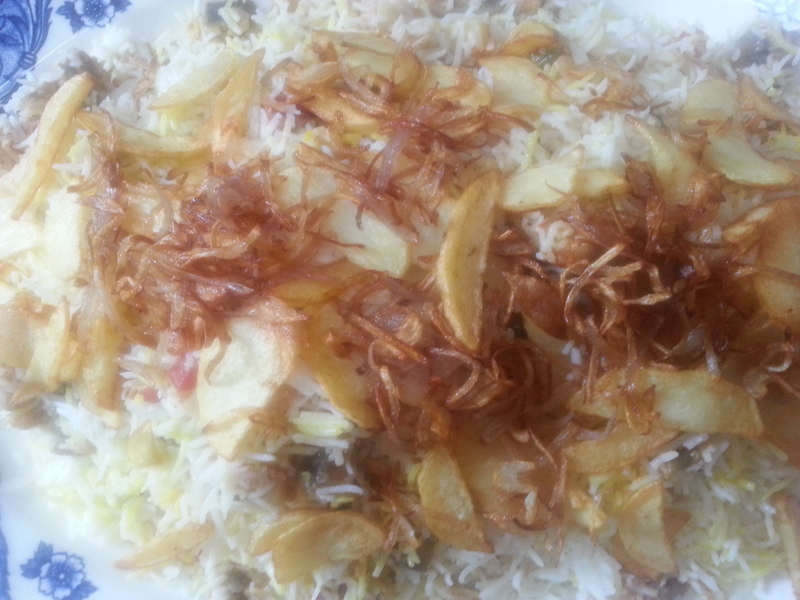 Just before serving, top the biryani with potatoes and crisp onions. Adapted from Anjum Anands cook book – Indian vegetarian feast.